Building the Pipeline: LGBTQ+ Leadership - Thank You To Our Sponsors and Guests! 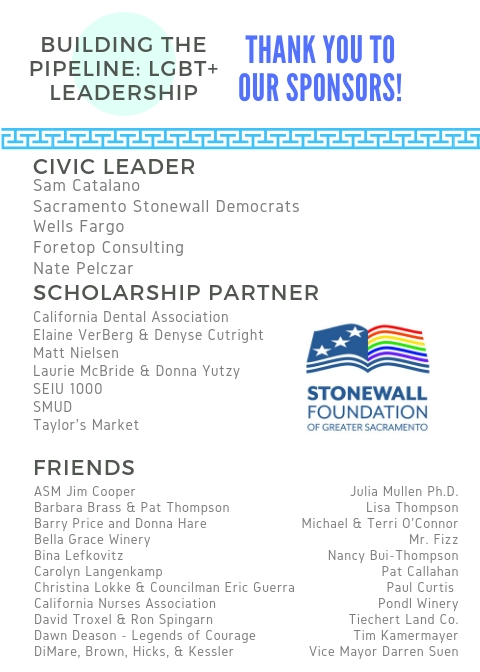 The Sacramento Stonewall Foundation welcomed many friends to its 2nd annual fundraising event, Building the Pipeline: LGBTQ Leadership. Supporters enjoyed wine tasting and LGBTQ history fun, all to promote and cultivate the next generation of LGBTQ advocates and leaders. Dr. John Johnson, Director of the Centers for Diversity and Inclusion at CSUS highlighted the need to continue to empower students to find success. And Travis Legault, 2018 McBride scholar, shared his appreciation of the work of the Foundation. 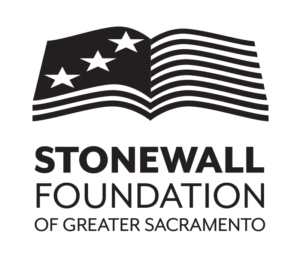 In addition to the McBride Scholarship, the Foundation also expanded opportunities for LGBTQ youth by sponsoring the SCUSD’s “Be Brave, Be You” LGBTQA student leadership conference, and partnered with the Sacramento LGBT Community Center to fund a high school internship through the city’s 1000 Strong initiative. Empowering and educating queer youth is critical to the continued struggle for basic rights, liberties and protections of the LGBTQ community. We thank our fast friends and new enthusiasts for their commitment to our endeavors.